How Do Rose Fertilizers Work? Soils are often deficient in the essential elements necessary for optimum rose plant growth. 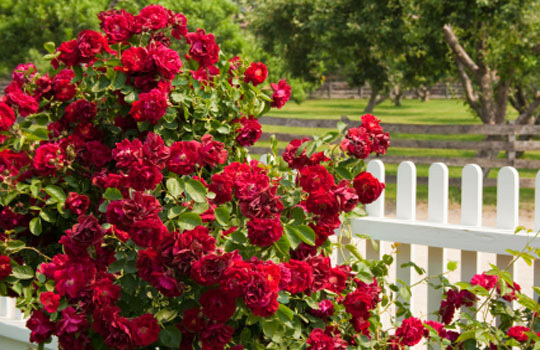 Rose fertilizers work by adding back into the soil these necessary nutrients. Any fertilizer will work to some degree. But roses will thrive best with an NPK fertilizer (nitrogen, phosphorous, potassium) ratio of about 1:2:1. This means more phosphorous than nitrogen or potassium. Too much nitrogen and the rose devotee may end up with beautiful green leaves but few blooms. The advantage of synthetic rose fertilizers today is that they are tailor made for the modern rose hybrids. They tend to be fast acting since they have optimized blends of minerals and are ready to go. Extensive research and field testing has led to a myriad of fertilizer selections for rose growers. Each comes with easily understood instructions and the fertilizer is usually packaged and easy to apply. Rose fertilizers are easily obtainable because they are available at most home and garden outlets. The biggest disadvantage of rose fertilizer lies in how it is applied. There is a tendency for gardeners to overuse rose fertilizer and/or to apply it at the wrong times. Too much fertilizer will kill roses; improper application results in less than desired results. Overusing a fertilizer on roses, in addition to probably killing the plant, also results in leaching of excess chemicals into waterways, contributing to increased contamination of water supplies. Overuse is also expensive to the grower. Fertilizer boosters are designed to supplement the action of fertilizers by helping plants better absorb the nutrients and to more efficiently take up moisture for use in dissolving the fertilizers. Through this added efficiency, growers are finding they can use less fertilizer on their roses and still obtain optimum growth results. BioWash improves the Cationic Exchange Capacity (CEC) in rose root systems, increasing their ability to more efficiently absorb essential nutrients and water. By helping enlarge the roots and strengthening the rose stems, the plant can more efficiently process vital nutrients found in rose fertilizers, resulting in a reduced need for these additives. A secondary benefit of BioWash is that it helps increase BRIX (plant sugar) in the plant, which has been found to reduce insect and disease damage. Field results reflect that some insects cannot digest plant sugar, so by increasing BRIX in the rose plant, growers are finding they can apply fewer insecticides. Beautiful roses, less fertilizer and insecticides needed, less cost to the grower….those are benefits we can live with!